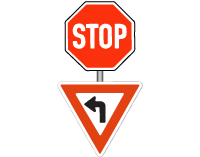 Purpose: To allow traffic turning left, to do so (if it can be done without interfering with cross traffic) without stopping. Action: If you intend to carry straight on, bring your vehicle to a standstill behind the stop line. • When turning left, yield to all traffic, which is close enough to pose a hazard. • Proceed only when it is safe.